It's almost over, music year 2013. Time for a brief photographic retrospective and of course the traditional New Year's card. Traditionally it is also free (pet)game "Call of the artists on the map '. Sorry, no prices, but the outcome may be correspondence. Best musical wishes for 2014!! The card contains some of the artists that I’ve photographed in 2013. Guess who they are! In the black border below the pictures, you can see their names. …, the number of unique visitors to my site over 5000 (2012: 3000), which together accounted for 65.000 hits (2012:40.000). On my Flickr account this year was 63.000 time (2012:23.000x) a picture. Again this year, most visitors came not from the Netherlands (8e plek), but from the Czech Republic, USA, Luxembourg in Japan. …I made a special black and white version of my photo of Keith Richards, which is now in a limited and numbered edition is sold at Gallery Blumann, an exclusive gallery on the oldest square (Place des Vosges) van Parijs. …exposeerde ik mijn werk op de Rotterdamse Kunstmanifestatie Route du Nord en op de Rotterdamse Kunstkalender 2014. …my pictures appeared in more magazines, books and documentaries than last year, among others: Rolling Stone, Penthouse, New York Magazine, Time Magazine and on Mexican TV. Also magazines and newspapers in o.ä. Mexico, Iceland, China, Spain, Hungary, Turkey, Australia, New Zealand, Israel,France, Finland, Italy, UK, Belgium, Nederland en Rusland publiceerden foto’s van mij via Getty Images. …were the most memorable concerts: Blur (Primavera Sound Barcelona), Nick Cave (Primavera Sound Barcelona), Allah-Las (Barcelona), Parquet Courts (Barcelona), Black Sabbath (Ziggodome), Iron Maiden ((Ziggodome), Charles Bradley (North Sea Jazz) en Primal Scream (Paradise). 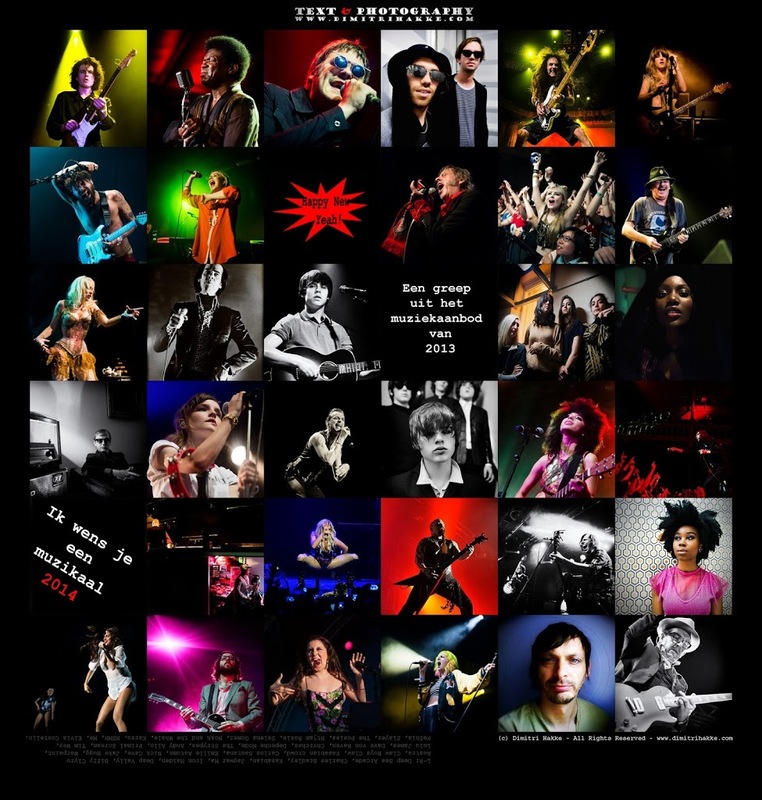 …I shot the most beautiful records of Iron Maiden, Charles Bradley, Lulu James, Claw Boys Claw, Andy Allo en Noah & The Whale. …brachten de foto’s van Selena Gomez het meeste geld in het laatje via Getty. …published my photos in the jubilee over 25 jaar Metropolis. …I was Duvel and IN10 hired to take care of their Duvel Vibes Campaign Photography. For three months I photographed new jazz talents and their hosts Sabrina Starke, Ntjam Rosie and Sven Hammond during performances, backstage, op festivals etc. Photos were used for mega banners, spotify-reclamecampagnes, advertenties en voor de website/facebookpagina. …I was approached by the New York photo agency The Hell Gate to me are to. Ik verwacht de eerste opdrachten voor hun te kunnen doen in 2014. …I also got out of the pop music again, nice jobs both photographic, writing, editing area such as capturing conferences (o.a. Geospatial/SKVR) and scholarships (Art at The Warehouse). New orders and customers are of course welcome in 2014! …up to 2014, with hopefully many fine concerts and exhibitions. And since it is precisely 20 years ago I made my first concert photos (Dynamo Open Air – May 1994), may 2014 not go unnoticed. How this anniversary year should be exactly form (expo or at last that long awaited book), remains to be seen. But that something is going to happen, that's for sure!